Back story: I told you in an earlier blog that at one of our jams Ben pulled a trick on me. He had taken a funny looking photo of me at our Intermediate Banjo Camp and had framed it and put it on the fireplace mantel in our jamming room where everybody could see it but me. Then he told me I had something wrong with my hair (really???) so I would have to turn around and look in the mirror over the fireplace. That's when I saw the picture. I've been waiting a long time to get back at Ben and he provided me with the perfect opportunity. Now, Dalton's pacifier is a little different. I had seen it in a fancy baby store in Winchester before he was born, and, overcome by a spasm of Grandmotherly-ness, I had loosened the strings on my admittedly tight purse and had shelled out 10 or 12 bucks for a pacifier! (My own mother probably had a Heavenly heart attack!) But it was soooooo cute. It had a darling little stuffed monkey attached to the end of the pacifier. As it turned out, Dalton loved the "monkey" pacifier from the get-go and has worn out several. 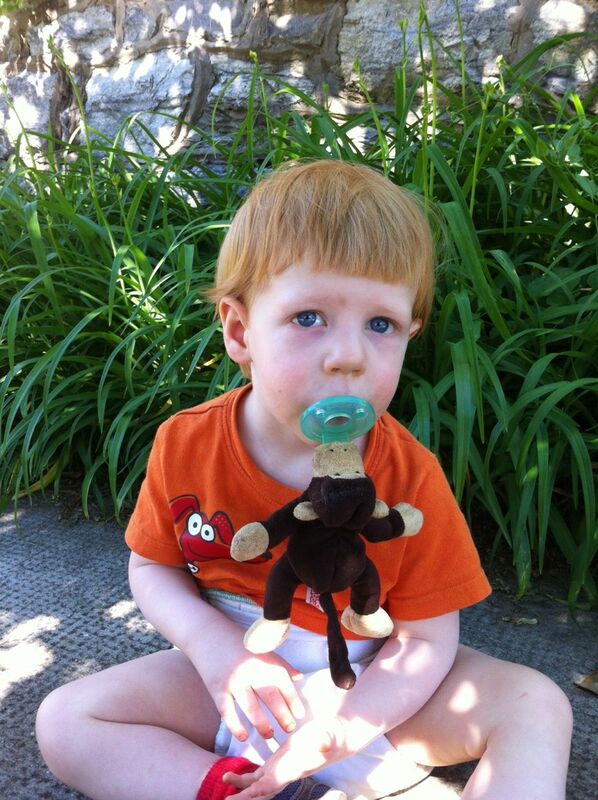 So, back to the picture I sent Ben: A freshly-shorn Dalton with the monkey pacifier. Ben texts back: "Awesome. I want a Binky like that!" I text: "I feel sure Casey can give you a used one!!!" Ben replies: "Really!! Would you ask for me so I don't get embarrassed!!" I ask Casey if she has an old monkey pacifier that she can stand to give up. Yes, she does, but being well-used, the monkey no longer has the actual pacifier attached to it. Nevertheless, it will do. So I take the monkey and put it in a Walmart plastic bag. I bring it to the jam. As it turned out, Ben was flying solo last night, without his adorable fashionista daughter, Kasey. (I so wanted her to be there.) Nevertheless, the joke must go on! So after we've picked a few numbers I announce, "I've got something to give to Ben." As Ben told me later, he immediately got a bad feeling. His skin went all prickly, his face got red, and his stomach started churning. Your basic "fight or flight" response. I told everyone the whole story of Dalton and his haircut and of sending Ben the photo. I finished up: "And Ben said, 'I want an Binky like that!'" By that time, I'm pretty sure Ben knew what was coming. I handed him the bag, he opened it, and voila! Ben had his very own Binky--a used monkey without the actual Binky attached! I said, "That will teach you to mess with me, Ben!" And, Ben, good sport that he is, replied, "Yeah, you got me good!" Of course, having the monkey provided plenty of opportunity for further fun. Like when Ben messed up playing something and I commented on it. He grabbed the monkey, set it on his shoulder and said, "I couldn't help it. 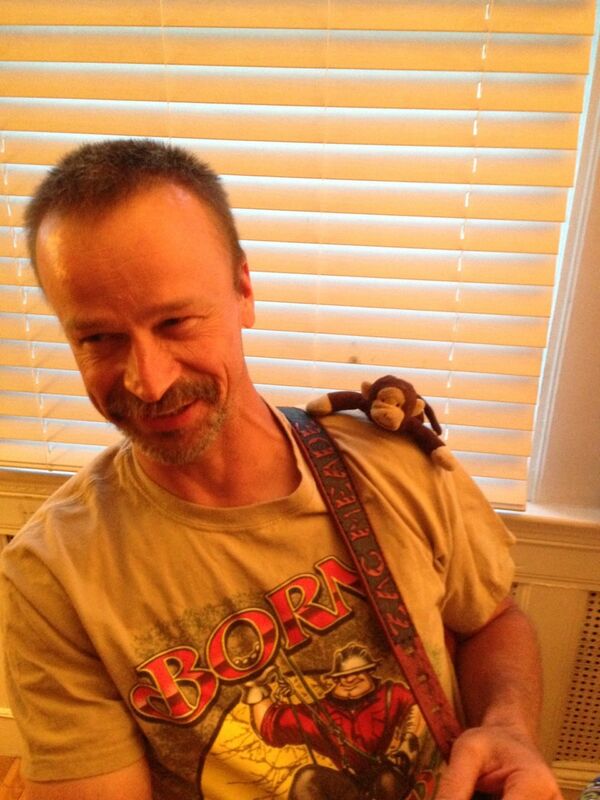 I had a monkey on my back!" And when Scott had some sort of misfire he looked at Ben and said, "I need the Binky!" Too much fun! In between all the funning, everyone did some great playing. Kristina joined us on mandolin and wailed away on her newest songs Blue Ridge Cabin Home and John Hardy. She's also learning her three-finger "chop" chords and how to use them in the Key of A. Kathy is still singing strong on I'll Fly Away and Wagon Wheel. We are keeping Salt Creek in the mix and, again, Bobby played an excellent guitar break. As I told him, "It sounded like you actually knew what you were doing!" Bob Mc reminded me that I wouldn't let him learn Salt Creek. I told him to get Casey to teach it to him! And I have to brag on Janet and her guitar playing. At her lesson, I pushed her a little and asked her to improvise a break--on the spot--to Mountain Dew and Lonesome Road Blues. I told her that the breaks didn't have to be "perfect"--there was no way that could happen--and when she made a mistake she had to keep going, no matter how bad it sounded. The goal was not to play "good" it was to play "something." I knew she could do it--and she did! You go, Janet!!! And while she didn't play these songs in the jam (this time! ), maybe this gave her a little courage, because she played her other leads really well. Kenney, as always, was solid on the bass and it was good to have him back after last week's absence. Yes, Kenney, I know Salt Creek was somewhat mystifying but it has a weird, complex chord pattern. You'll get it. Just remember: after you learn it in the key of G for this jam you'll go to another jam and a mandolin player will kick it off in the Key of A (where the Stanley Brothers recorded it) and you will be scr.....let me just say you'll be in trouble!. Aren't capoes wonderful?? Don't you wish you had one for the bass??? My book signing Saturday June 8 at 3 pm at the Winchester Book Gallery on the Old Towne Mall in Winchester. On Monday June 10, I will be doing a live, on-the-air interview with radio station WILL--AM--FM, the public radio station at the University of Illinois. They stream the show live so you can listen online at: http://will.illinois.edu/focus. The broadcast will be on CENTRAL TIME, so the interview will run from 10:00 to 11:00 Central. It's a call-in show for you folks in the Illinois listening area. I don't know if you can send in questions by email. Maybe! It will be my first radio interview about the book! And don't forget The Longest Day Jam, Friday, June 21, in Winchester, 9 am-9 pm. More info in previous blogs. Gooseneck Rockers and Hicks Sisters performing!!! Posted in Uncategorized on June 7, 2013 by admin.